Aryans Resort is located in Vagtor, 1 km from Chapor Fort. 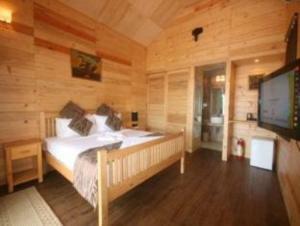 It offers 2 dining options, an outdoor swimming pool and cottages with views of the skyline. Free parking is provided. Modern décor and hardwood furnishings feature throughout the wooden cottages at Aryans. Each is fitted with a TV, minibar and personal safe. En suite bathrooms have shower facilities and a hairdryer. Available for all-day dining, the restaurant serves a variety of seafood and barbecued dishes. Refreshing beverages are offered at the bar. Staff at the 24-hour front desk can assist with currency exchange, car rental and bicycle rental services. Travel bookings can be made at the tour desk. Resort Aryans is 4 km from Siolim Town and 5 km from Chapor River. Morijim Beach is 20 km from the resort. Free! All children under 5 years stay free of charge when using existing beds. One older child or adult is charged INR 2250 per night and person in an extra bed. Maximum capacity of extra beds in a room is 1. There is no capacity for cots in the room. Any type of extra bed or child's cot/crib is upon request and needs to be confirmed by the hotel. Supplements will not be calculated automatically in the total costs and have to be paid separately in the hotel.